On Oct. 4, 2018, Pennsylvania Corrections Department mail inspector Brian Strawser sorts inmate mail at Camp Hill state prison in Camp Hill, Pa.
Davon Hayes, a Pittsburgh man serving a life sentence for a crime he's always denied committing, recently received an opportunity that's almost lottery-win rare: a second shot at a federal habeas petition, the last resort for those seeking exoneration. He learned in 2016 that the nephew of William Anderson, a candy store owner who was shot and killed in 2003, had told police the day of the shooting that Hayes was not one of the three men he saw before and after the crime — evidence Hayes alleges the police and prosecutors have withheld for the last 15 years. But in the middle of this time-sensitive battle, Hayes is facing a new obstacle. His lawyer at the federal public defender's office will no longer send him legal mail, for fear that new mail-handling practices at the state Department of Corrections violate requirements for privileged communication. 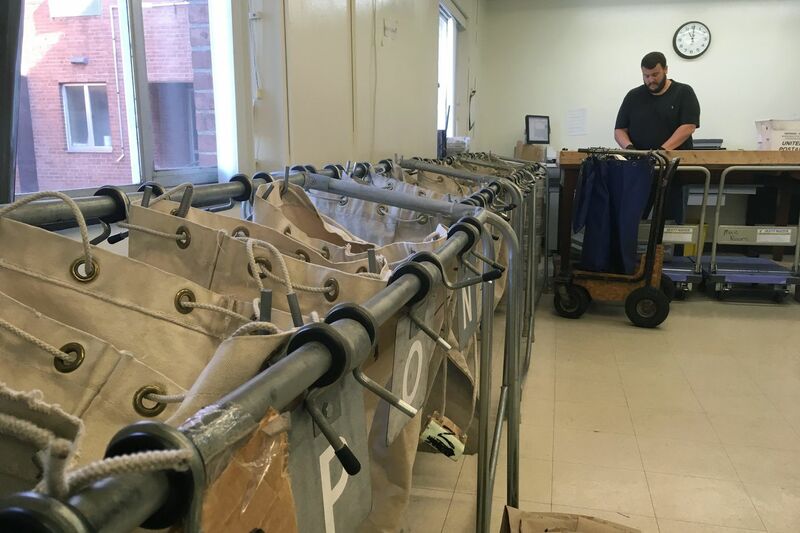 Under the policy, announced in September along with a number of other measures designed to close off avenues for drug smuggling, staff are to photocopy inmate mail and secure the originals for disposal by third-party vendors. On Tuesday, Hayes and a group of nonprofit legal-services organizations filed a lawsuit in U.S. District Court for the Middle District of Pennsylvania seeking an injunction against the state prison system and alleging that the legal mail policy is unprecedented and "an exaggerated, irrational response to a nonproblem that deprives Mr. Hayes of an indispensable — and often the only viable — means of communicating with his attorneys." An accompanying lawsuit names the Pennsylvania ACLU, the Pennsylvania Institutional Law Project, Abolitionist Law Center and Amistad Law Project as plaintiffs who say the policy violates their First Amendment rights. The lawyers said they hope to get a hearing for a preliminary injunction in December. The outcome of the lawsuits may turn on whether the restrictions in the policy serve a legitimate security purpose. The plaintiffs allege that the "DOC is not aware of any instance whereby attorneys have introduced contraband into DOC facilities via legal mail," though the department told them there was at least one occasion in which a third party attempted to mail in contraband in an envelope falsely labeled as legal mail. Amy Worden, a department spokesperson, said that legal mail had been a source of contraband, including synthetic cannabinoids, and that the solution the department came up with was "the only process that would both ensure confidentiality of privileged communications and prevent the introduction of drugs into the prison." The department said in an Oct. 19 statement that the various security measures, including the elimination of all postal mail, increased screening for visitors, and even drone detection gear, are working, noting an approximately 50 percent decline in the number of positive drug tests, drug finds within the prison, and drug-related inmate misconducts. Those figures compared September against August 2018, when drug-related incidents had spiked. Morgan-Kurtz said that for her organization, which provides legal advice to 800 inmates each year, the new practices raise grave questions about the future. "We have a growing pile [of documents from people] who are pursuing cases on their own, pro se, and now have no access to legal advice from anyone. … As this policy continues, the burden will only grow," she said.